The global livestock industry has recently been inundated with criticisms about the impact of animal production systems on anthropogenic greenhouse gas emissions (GHG), animal welfare, environmental sustainability and human health and well-being. Although it is accepted that the estimate of GHG emissions from animal agriculture has been exaggerated by the FAO's publication "Livestock's Long Shadow", the 18% estimate is a gross exaggeration. Industrialisation in the agricultural sector in some developing countries without "enlightenment" has been associated with environmental problems like among others, land degradation and water pollution. It is estimated that global livestock production will double by 2050 to satisfy demands, which suggests a faster than expected growth compared to any other agricultural sector. Demand for meat, milk and eggs is expected to increase by about 30% in the next 8 years. These trends resulted in calls for stricter environmental and animal welfare legislation. By contrast, there are also growing concerns about the world's ability to provide in the considerably growing protein needs of a rapidly growing human population, especially in developing countries where it is unlikely that the demands will be met. The importance of the latter is emphasized by the UN's focus on 'the right to food as a global goal' and the fact that Rio+20 will also have to be held accountable for the effects of environmental legislation on humans' physical and economic access to food. The purpose of this paper is to focus on some of these conflicting issues and the effects of a shift to intensive production systems on the ethics of meat production, quality and animal welfare in African countries with knowingly limited natural resources. Our world has become increasingly complex, particularly after the 1800's due to the rapidly growing human population that is greatly dependent on the earth's natural resources for survival. Humans have always been dependent on the natural resources on earth, but we have been slow to respond to the challenges of diminishing quantities of non-renewable natural resources. Unfortunately the burden of this dependency was only realized well after the industrial revolution and subsequent intensification of agricultural production to provide food for rapidly escalating human populations worldwide. Although few of us spend time to think about the potential consequences of a continuously growing human population, the current reality is that the world is literally faced with a human dilemma. The size of the human population is escalating at a rate that is ecologically unsustainable - it took almost all of human history until the 1800's to reach 1 billion people, another 100 years to reach 2 billion, followed by 3 billion another 30 years later, and then the world gained an addition billion people approximately every 11 years thereafter (UN, 2004a). The world population reached the 7 billion mark between October 2011 (according to the United Nations Population Fund) and March 2012 (according to the United States Census Bureau, USCB), which is regarded by the aforementioned as "a serious challenge". Future projections suggest a world population of about 7.5 to 8 billion by 2025, 11 billion by 2050 and a worst case scenario of 16 billion world inhabitants by 2100 (UN, 2004a). The total ecological impact on earth due to human activities is determined primarily by the size of the human population (Sustainable Scale Project, 2003), which under current conditions exceeds the earth's bioproductive capacity or carrying capacity (Daily & Ehrlich, 1992). The world's status quo is so eloquently described on a plate inscription at the Apartheid Museum in South Africa namely: "... a world that is both powerful and fragile; on the verge of disintegration, but held together by its own volition; fleeing its fate and at the same time, striding towards its destiny." The human dilemma has two unfortunate consequences namely (1) the rapidly growing human population has a major and direct negative ecological impact due to the increase in concentrations of atmospheric greenhouse gasses (Onozaki, 2009) and (2) indirect increase in concentrations of greenhouse gasses due to the use of technologies (many of which damage the environment due to the level of exploitation) for the increasing utilization of renewable and non-renewable natural resources for food production, transportation, wealth creation and modern lifestyles. Animal agriculture in southern Africa is based on a unique combination and synergy between extensive and intensive animal production systems, but concerted efforts need to be made to increase the productivity of all production systems (communal, commercial, extensive and intensive) in order to supply the demand for animal products. Productivity can be improved through advances in different facets of production systems, from conception to consumption and by employing new technologies. Such systems will have to be based on ethical practices and preferably a voluntary code of conduct in order to meet consumer demands for safe products of a high quality from environmentally sustainable production systems. The aim of this paper is to investigate the potential and limitations associated with livestock production and the possible ways to supply the growing demand for red meat of acceptable quality from environmentally sustainable production systems in southern Africa, within the framework of a rapidly changing world. The growing human population and the concomitant technologies employed to sustain life as we know it, have resulted in a significant increase in anthropogenic greenhouse gas (GHG) emissions. Carbon dioxide [CO2], methane [CH4] and nitric oxide [N2O] are collectively the most important greenhouse gasses and contribute most to global warming due to the trapping of greenhouse gasses (Pitesky et al., 2009). Carbon dioxide is used as standard reference for global warming potential - one unit of CO2 can trap 1 unit of heat. Methane and nitric oxide can trap respectively 23 and 296 times more heat compared to CO2, but the collective effects of all these GHG's are usually combined and expressed as CO2 equivalents. GHG's are released into the atmosphere due to biogenic and anthropogenic emissions. Biogenic emissions are due to natural biochemical cycling of carbon and nitrogen, while anthropogenic GHG emissions (Table 1) are due to human activities. 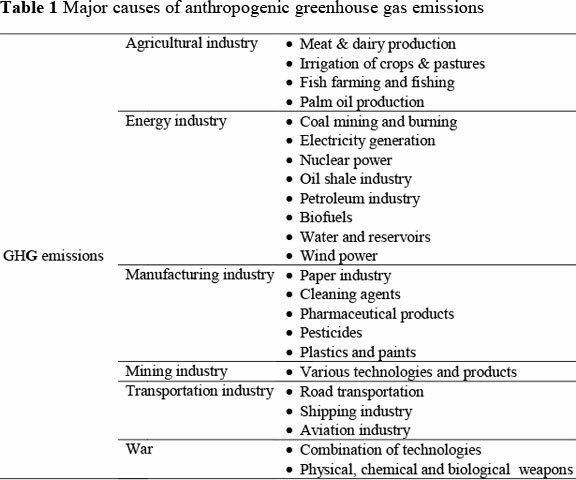 The major cause of anthropogenic GHG emissions into the atmosphere is due to the burning of fossil fuels like coal, oil and natural gas for the generation of electricity, transportation and heating of homes (Table 1). The Food and Agriculture Organisation (Steinfeld et al., 2006) has recently emphasised that the agricultural sector also release noteworthy amounts of CO2, CH4 and N2O into the atmosphere. It was initially estimated that animal agriculture's contribution to the total global GHG emissions is about 18% (Steinfeld et al., 2006), but the calculations were widely questioned. A more recent report indicates that the entire agricultural industry in the USA (a country that is regarded as being most advanced in terms of intensive livestock production) is responsible for about 5.8% of the gross greenhouse gas emissions in the USA, of which livestock constitutes an estimated 2.8% (Holtkamp et al., 2006). Similar results were obtained from data from the state of California (California Environmental Protection Agency, 2005). The significance of data from the state of California is that it is the largest dairy and agricultural sector in the USA, so these calculations provide a good indication of the effect of intensive animal agriculture on GHG's. According to Pitesky et al. (2009), livestock contributes much less to anthropogenic greenhouse gas emissions as compared to the total transportation industry (estimated at 26%) in the USA. Nevertheless, livestock production contributes a substantial proportion of the global CH4 and N2O emissions and these gasses have higher global warming potentials (GWP) as compared with CO2. In addition, animal agriculture also contributes to environmental degradation, water pollution and loss of biodiversity. According to Steinfeld et al. (2006), the livestock sector is one of the major contributors to environmental problems on a global scale. A growing world population requires more food and other resources to support life on earth (Roughgarden, 1979). The inevitable consequence is an intensification of systems: agricultural production systems, transportation systems, mining systems, water utilization and reticulation systems and utilization of other natural resources. It is obvious that more land and more resources are required to produce more food and feed to support a growing human population. In 1800 when the size of the human population was about 1 billion people, this could be easily achieved, but with forecasts of more than 11 billion people by 2050 (Figure 1), the pressure on our natural resources escalates so rapidly that much of the renewable and non-renewable resources will be depleted long before alternative energy sources are found and environmental friendly production systems are devised. Although the percentage growth rate of the human population has already started to decrease in some countries (Figure 2), it appears that humans have already exceeded the earth's carrying capacity (Daily & Ehrlich, 1992). We can no longer afford cornucopian thinking (from Greek mythology which refers to the "horn of plenty") and believe that substitutes will become available for resources that are depleted. It follows that there are growing concerns about the world's ability to provide in the mounting protein needs of a growing human population, especially in developing countries where it is unlikely that the demands will be met (Ilea, 2009). The importance of the latter is emphasized by the UN's focus on 'the right to food as a global goal' and the fact that Rio+20 will also have to be held accountable for the effects of environmental legislation on humans' physical and economic access to food (UN, 2004b). According to the United Nations, food security or the right to adequate food is achieved when all people have physical and economic access at all times to food or the ability to buy enough food. Demand for meat, milk and eggs are expected to increase by about 30% in the next 8 years. In order to provide enough food for all humans by the year 2020, total meat and milk production will have to increase to about 300 and 700 million tonnes, respectively. It is estimated that global livestock production will have to double by 2050 to satisfy demands, which suggests a faster expected growth than any other agricultural sector (Ilea, 2009). 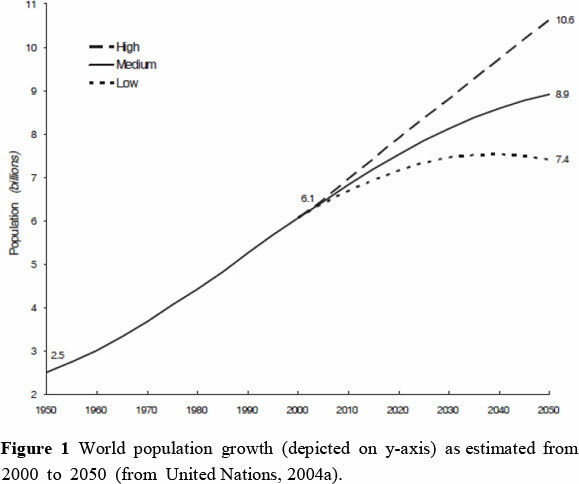 Most of this growth is expected to occur in the developing countries. 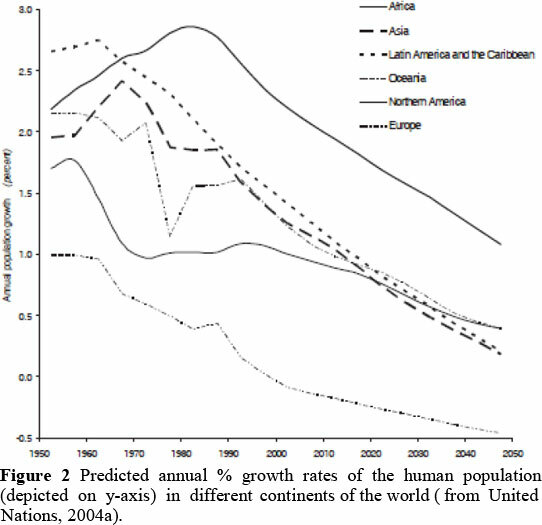 The growth and dynamics of human populations are dissimilar on different continents, which results in unique scenarios in terms of per capita consumption and utilization of natural resources (UN, 2004a). In some countries or on some continents, the level of development has reached a point where social and environmental responsibilities are addressed as national priorities, while many developing countries are still trying to cope with the burden of food security and access to clean water. These disparities and changing role of agriculture have serious consequences on the ethics of animal agriculture due to the changing nature of the enterprise (Fraser, 2005). The burning question from an animal agricultural point is how to provide enough food to a growing world population with the least adverse impact on the environment, whilst meeting consumer demands in terms of ethical and environmentally responsible animal production systems. Specific questions that need to be dealt with on the African continent include (1) what is ethical animal production in the southern African context, (2) can we afford to discredit technologies and intensive livestock production systems in countries that cannot supply the demand for meat, milk, eggs and other vital products from animal origin, especially given the mounting problems associated with under nutrition and malnutrition on the continent. What is ethical livestock production? Animal ethics concerns the way in which animals are housed, bred, fed and cared for - it entails all aspects of good husbandry practices and veterinary care. These aspects have to be managed in such a way that it does not harm the environment or people working with animals. The traditional perception of animal farming was one of extensive systems where livestock could roam on large areas. There is an admiration of the traditional farmer and farm family (Fraser, 2005), which no longer applies to modern farms. The need for more food has changed the nature of animal production systems significantly. Also, the societal demand for cheap food was a primary driver for the intensification of production systems. There has been a shift from extensive farming systems to more intensive systems and in some species like pigs and poultry the typical factory farms became more prevalent. In many cattle and sheep production systems, a combination of extensive and intensive systems is used as part of a production cycle. Nevertheless, there is a perception that big corporations have taken over family farms and the animals that used to be cared for with kindness, are no longer cared for in the same way (Fraser, 2005). The latter is of course far removed from the truth, but forms the basis of the so called "Standard Critique". Big corporations are also accused of increasing profit margins at all costs, so the traditional animal care values have been displaced by corporate greed. There is a general perception that intensive systems are synonymous with confinement systems and that such systems are disastrous for animal welfare (Fraser, 2005). The latter view is often propagated by animal rights movements, although much of this is based on very little investigation and analysis. Most modern animal producers embrace the traditional values of stewardship and care of animals. It follows that intensive animal production systems are criticized, more so due to the changing nature of the system rather than the ethics of production (Fraser, 2005). Intensification of animal production systems are also criticized about its contribution to anthropogenic GHG's, animal welfare, environmental sustainability and human health and well-being. However, it is well-known that production efficiency is significantly better in intensive systems due to improved feed efficiencies and shorter feeding periods. In addition, intensively fed livestock produce much less CH4 as compared to grazing ruminants due to the lower crude fibre content of the diets. It should also be born in mind that intensive systems are only employed for certain species like poultry and pigs and only in certain countries. Intensive fattening of livestock is not equally popular in all countries, and if this method is employed, animals are only fed for a small proportion of the production cycle. In South Africa for example, feedlot cattle are fed for 90 to 110 days. The majority of these animals originate from extensive farms, but about 70% of all the animals slaughtered are fattened in feedlots. The latter process has been driven mainly by consumer demand for a specific type of meat product in terms of consistency of quality and sensory attributes. The perception of many philosophers is that intensive livestock production systems have a negative effect on the moral status of animals and adversely affect the environment (Ilea, 2009). Although many of these perceptions are based on the intensification of animal production systems rather than animal ethics per se, the livestock industry has to take cognisance of these views and inform consumers better about the benefits of such systems. Although intensive systems make use of confinement, confinement per se is not a modern development. Fraser (2005) argues that this practice has been part of animal agriculture long before systems were intensified. In many countries, family-owned systems remain the foundation of animal production and the size of such operation does not correlate with the quality of animal care provided. It appears that the quality of animal care depends more on the characteristics of the manager rather than the production system. According to Fraser (2005), the most important determinants of animal welfare are not specific to any one type of housing and production system. Animal welfare is influenced more by the skill and amount of time spent by staff, the quality of the feed, disease prevention and overall management. The South African red meat industry was deregulated in 1992 and import control was abolished in 1994. Currently the only interventions in this sector from government are those related to health and phyto-sanitary measures and tariff protection (Neethling, 2005). Production and marketing of red meats in South Africa are collectively promoted and managed by the Red Meat Producers Organisation (RPO), the Red Meat Abattoir Association (RMAA) and the Association for Meat Importers and Exporters (AMIE). Meat exports and imports are promoted and monitored by the Association for Meat Importers and Exporters (AMIE), with the emphasis on reducing the risks and complexities associated with meat marketing. These organisations have been very successful in terms of exporting meat to a number of countries worldwide. It is estimated that about 69% of agricultural land in South Africa is used for extensive grazing of livestock, which includes cattle, sheep, goats and game. Since 1994, the number of cattle has increased by more than 1 million animals to about 14.1 million head of cattle, although some cattle in communal areas are still unaccounted for (DAFF, 2010). Approximately 60% of the total South African cattle population is in commercial systems and 40% in communal systems. Many of the market players in the beef industry are vertically integrated, so the major role players have their own feedlots, abattoirs and retailers. Beef production increased from 512 000 tons in 2000 to just over 750 000 tons in 2009, which represents an increase in beef production during this period of approximately 46.6%. The total number of cattle slaughtered increased only marginally during this period by about 7% (from 2.7 million to 2.9 million cattle). During the same period, consumption of beef increased by just over 20% from 671 000 to 815 000 tons per annum. 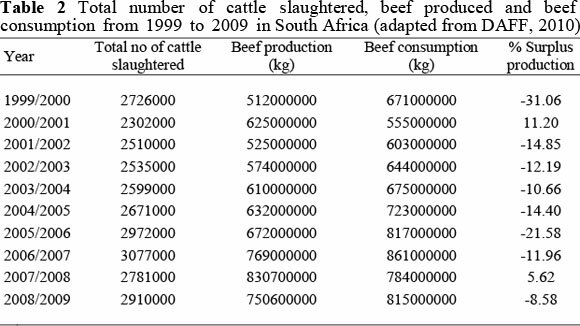 It is clear that the South African beef industry cannot supply the local demand for beef, due to a consistent shortfall of about 10% per annum during the past 10 years (Table 2). In addition, beef exports increased by about 34% from 2000 until 2009, albeit relatively small volumes of between 5 000 to 10 000 tons per annum during the previous decade. Most of the exports was to SADC countries, followed by exports to the United Kingdom, the European Union and recently also to the United Arab Emirates, Lebanon, Nigeria and Angola. Exports to countries like Mauritius, Switzerland, Seychelles and Ghana are also growing (DAFF, 2010). However, the indications are that beef exports will increase during the next decade due the growing demand for meat in Africa as well as the growing demand for natural or organic beef in the European Union. It is estimated that developing countries will need an addition supply of about 100 million metric tons of meat by 2020 to satisfy the demand. Africa will represent a significant portion of this increased demand for meat due to the rapid population growth in countries like Nigeria as well as the expected 'recovery' in population growth in countries like South Africa. The 19th century is characterised by two major technological developments that improved the marketing of livestock, namely improved transportation networks and new ways to preserve perishable products (Fraser, 2005). It is now possible to produce any product virtually anywhere in the world and process it at convenient locations. Improvements in the supply-chain management systems in countries or even on continents need to be improved and these should be designed based on the best possible use of environmental resources, for example the duplication of infrastructure should be weighed against the cost of transportation and storage. Consumers are becoming more aware of the impact of systems in terms of fossil fuel utilization and the agricultural industry need to plan accordingly. A study in Scotland suggests that there is still low commitment from consumers to buy organic meat and a generally low regard for ethical issues in terms of consumer values towards meat (McEachern & Schröder, 2002). It is inevitable that animal production systems will become more intensified as the demand for food increases. The challenge is to intensify the systems in an environmentally responsible way. Intensification of animal production systems has already resulted in calls for stricter environmental and animal welfare legislation. These aspects are core values of animal husbandry systems and it is preferable that the agricultural industry implement voluntary regulations and procedures that will ensure ethical and environmentally sustainable production. Agriculture in Africa is often regarded as free range or natural and this is a unique selling point for animal products from this region. However, it should be realised that not all aspects of extensive production are beneficial - such systems tend to be burdened by a variety of diseases and zoonoses, poor efficiency, low productivity and inconsistent product quality and supply. Animal agriculture in South Africa is based on a unique combination and synergy between extensive and intensive animal production systems, but it is clear that it cannot supply the demand for meat. A concerted effort needs to be made to increase the productivity of all production systems (communal, commercial, extensive and intensive) in order to supply the local demand for animal products. The local beef industry needs to increase beef production by about 11% per annum (approximately 20 000 to 30 000 tons of beef extra per annum) over the next decade to supply the demand for local use and exports. This will probably increase local beef production to close to 1 million tons of beef per annum within the next decade. The utilization of formal breed improvement schemes provides a unique opportunity to increase the efficiency of animal production in southern Africa. Breed improvement schemes are particularly useful in countries where environmental factors are more limiting. Increasing selection pressure on growth and efficiency of livestock has resulted in changes in their phenotypes and production characteristics, but in some instances animals have reached their physiological limits to cope with biological demands (Webb & Casey, 2010). This has resulted in failure of animals to reproduce or produce, and adversely affected product quality. New genetic technologies and a better understanding of the underlying physiological principles make it possible to make the best use of available genetic resources without adversely affecting animal welfare or product quality (Webb & Casey, 2010). The use of such technologies is vital because consumer safety and satisfaction are no longer negotiable. It is important that all aspects of the production cycle be managed in an ethical and acceptable way. This includes all facets of breeding and production, general husbandry procedures and processing, fattening, transportation and humane slaughter procedures. Each of these aspects require a well-designed and industry approved code of conduct to ensure consumer safety and satisfaction. Southern Africa has huge capacity and potential to increase meat production, particularly in communal systems. But this can only be achieved if production (off-take) and marketing systems are drastically improved during this period. This can be done in different ways depending on available resources and infrastructure. Productivity can be improved at different levels through formal breed improvement schemes, through better management of the entire production cycle from conception to consumption and by employing new technologies. However, the nature of beef production does not need to change significantly and intensification is not necessarily required. In southern Africa, cattle can continue to be reared in mostly extensive systems, but production can be increased considerably by using better genetic material and by including a more intensive fattening phase into the production cycle. Communal animal production systems have huge potential in this regard, especially if access to markets is improved. Such systems will ensure a more consistent supply of good quality products, but it will have to be based on ethical practices and preferably a voluntary code of conduct in order to meet consumer demands for safe products of a consistently high quality. It is crucial that production system should be environmentally sustainable, regardless whether such systems are intensive or extensive. The agricultural sector will have to guard against the injudicious use of land like deforestation of areas for agricultural purposes. Finally, animal agriculture will have to ensure that all aspects of production cycles are ethical and endorse the basic values and rights of modern society. Livestock production in southern Africa is a predominantly extensive affair, although about 70% of the animals slaughtered are fattened in feedlots for 90 to 110 days. The current system does not supply the local demand for meat and there is more pressure to export to other African countries as well as the European Union. Although current export volumes are relatively low, the growing human population and increasing level of income of South African families will increase the demand for meat. Intensification of production systems is inevitable; this can be practiced in a sustainable way in certain phases of the production cycle, so that the nature of the system is not changed drastically. This can be achieved by employing formal breed improvement schemes, ethically acceptable practices and technologies based on a voluntary code of conduct to ensure consumer satisfaction in terms of safe products of a high quality from environmentally sustainable systems.